Wei LAB Director Jerlando F. L. Jackson will speak today during the final session of the public Black Minds Matter online course. Throughout the eight-part webinar series, Black Minds Matter covered the experiences and realities of Black males in education, connecting the Black Lives Matter movement and the ways that Black minds are engaged in the classroom. Dr. Jackson will be joined by Dr. Ivory Toldson from Howard University, Vanessa McCullers from Moms of Black Boys United, and Dr. Robert Simmons III from Campaign for Black Male Achievement. To learn more about the course, click here. You can also connect with Dr. J. Luke Wood, creator of the course, on Facebook here. The Wei LAB and the Todd Anthony Bell National Resource Center on the African American Male at The Ohio State University are delighted to announce that the 6th Annual International Colloquium on Black Males in Education (ICBME) will be held in Toronto, Canada on October 4-6, 2017. The event will be preceded by the Pre-Colloquium on October 2-3, 2017. Toronto, named as the world’s most diverse city in a recent BBC study, provides a unique opportunity to explore issues related to equity and inclusion for Black men, not just in the city, but around the world. Since 2012, the first convening of the Colloquium, ICBME has allowed researchers, practitioners, policymakers, students, and concerned citizens to come together for careful discussions on the key issues facing Black boys and men in education. Previous meetings were held in the United Kingdom, U.S. Virgin Islands, the United States, Jamaica, and Bermuda. Over the last five years, the Colloquium has grown from an intimate congregation of scholars and practitioners into a weeklong affair offering a wide range of events suited for a variety of participants interested in the education of Black males. The ICBME staff will continue to provide updates on the Colloquium in the upcoming weeks. To remain updated, visit the ICBME website, follow the hashtag #ICBME17 on Twitter, and follow us on Facebook. For any questions, comments, or concerns, email us. Dr. Jerlando F. L. Jackson delivered a keynote at the Accelerating Data-Driven Collaboration for Large Scale Progress conference. The conference was held April 3-5, 2017 in Kansas City, MO. The event focused on identifying new ways to gather data and make evidence-based decisions in research projects. The conference was funded by the National Science Foundation (NSF) Inclusion across the Nation of Communities of Learners of Underrepresented Discovers in Engineering and Science (INCLUDES) awards. The event was conducted in collaboration with the University of Missouri-Kansas City (UMKC) Institute for Human Development and UMKC School of Computing and Engineering, a recipient of an INCLUDES grant. NSF INCLUDES is an initiative that works to broaden the participation of minority students in STEM (science, technology, engineering and mathematics) fields. Thirty-seven projects were selected to receive an INCLUDES grant, including one that was awarded to Wei LAB staff members. For more information about the conference, click here. For more information on the NSF INCLUDES grants, click here. The workshop featured opportunities for the grantees to share their proposals and receive peer and expert feedback, as well as learn more on how to design backbone functions for their projects and move forward in their research endeavors. The training workshop was aimed at NSF INCLUDES Launch Pilot grantees. Dr. Jackson serves as Co-PI for one of these grants, awarded in September for a project titled “The Consortium of Minority Doctoral Scholars (CDMS).” Dr. Jackson also serves as the Vilas Distinguished Professor of Higher Education in the Department of Educational Leadership and Policy Analysis at the University of Wisconsin-Madison. Wei LAB Assistant Director and Senior Research Associate Dr. LaVar J. Charleston serves on the Social Science Research Team as Senior Personnel for the grant. The goal of the project is to broaden the participation of minorities in the STEM fields. Wei LAB Director and Chief Research Scientist Dr. Jerlando F. L. Jackson and Wei LAB Assistant Director and Senior Research Associate Dr. LaVar J. Charleston traveled to Tampa, FL to collect data for the National Science Foundation (NSF) Inclusion across the Nation of Communities of Learners of Underrepresented Discoverers in Engineering and Science (INCLUDES) Consortium of Minority Doctoral Scholars (CMDS) project at the McKnight Annual Research and Writing Conference on February 24-25. The INCLUDES CMDS Project focuses on researching mentoring strategies used to address recruitment and retention concerns with women and ethnic minority populations, specifically for African Americans and Latinas pursuing doctoral degrees in STEM. Data was collected from in-person interviews to understand the mechanisms that non-traditional mentoring programs, like McKnight, use in order to support minority students. The McKnight Doctoral Fellowship Program was one of three programs that will be used to collect data for this project. The other two programs are the Southern Regional Education Board (SREB) and the National GEM Consortium. “McKnight, SREB, and GEM have moved the bottom line for underrepresented groups pursuing PhDs in the United States,” Dr. Jackson, who also serves as the Vilas Distinguished Professor of Higher Education in the Department of Educational Leadership and Policy Analysis at the University of Wisconsin-Madison, said. The purpose of this research is to understand the collective impact of McKnight, SREB, and the National GEM Consortium on minority doctoral students. The project aims to better understand the experiences related to participation and to identify successful mentoring strategies that can be used to increase the number of minority Engineering and Computer & Information Sciences students who go on to obtain a PhD and research and faculty positions. “With national mandates to broaden participation in STEM, particularly at the doctoral and faculty levels, we have the opportunity to glean critical attributes of these interventions that have a proven track record of success. The implications of this work may have broader impacts to institutions around the country aiming to diversify their scientific faculty,” Dr. Charleston said. The McKnight Mid-Year Annual Research and Writing Conference was developed for the McKnight Doctoral Fellowship Program and provides opportunities for its fellows to present research and receive professional advice, as well as collaborate with peers and receive assistance on exam preparation and dissertation proposals. The McKnight Doctoral Fellowship Program is part of the Florida Education Fund (FEF), a non-profit corporation established in 1984. To learn more about the McKnight Fellowship program, click here. Wei LAB Director and Chief Research Scientist Dr. Jerlando F. L. Jackson presented at the National Association of Student Affairs Professionals (NASAP) 2017 conference on February 17. The 63rd annual conference was held February 16-18 in Durham, North Carolina. Dr. Jackson led a session titled “Honoring the Legacy of a Former NASAP President and Student Affairs Stalwart: A Tribute to the Career of Dr. Melvin C. Terrell” along with Fred Bonner from Prairie A&M University, D. Jason DeSousa of Morgan State University, Sharon Holmes of Binghamton University, and Lemuel Watson of the University of South Carolina. The session honored the work and accomplishments of former NASAP President and Editor of the NASAP Journal, Dr. Melvin C. Terrell. The presenters all co-wrote the book Advancing Equity and Diversity in Student Affairs: The Applied Scholarship of Melvin C. Terrell. Dr. Jackson also serves as the Vilas Distinguished Professor of Higher Education in the Department of Educational Leadership and Policy Analysis at the University of Wisconsin-Madison. For more information on the NASAP Conference, click here. The Wei LAB is proud to announce the 10th annual Asa G. Hilliard III and Barbara A. Sizemore Research Course on African Americans and Education. The course will be offered during the 2017 annual meeting of the American Educational Research Association (AERA). Participants in the course will learn the fundamentals of developing a research career focused on African American populations in education. They will also have the chance to work directly with researchers on questions and methods to guide their research studies. The course will include sessions on manuscript development and research design techniques. Wei LAB Director and Chief Research Scientist Dr. Jerlando F. L. Jackson and Belk Distinguished Professor and Endowed Chair Chance Lewis of the University of North Carolina-Charlotte will serve as directors of the course. The course will take place Thursday April 27, 2017 from 9:00 a.m. to 5:00 p.m. during the AERA annual meeting in San Antonio, TX. Applications for the course will be accepted until March 1, 2017 at 5:00 p.m. The course is sponsored by the Wei LAB, Urban Education Collaborative, Bell National Resource Center on the African American Male, and the Quality Education for Minorities (QEM) Network. Wei LAB Assistant Director and Senior Research Associate Dr. LaVar J. Charleston presented his research project “Double-Sided Mirrors: The Media’s Impact on the Academic Identity Development of Black Male Student-Athletes” at the Ethnographic and Qualitative Research Conference (EQRC) on January 31, 2017. The paper is co-authored by Raul Leon from Eastern Michigan University. Their research focuses on how Black male student-athletes form their identities and how the development of their academic identity is influenced by media messages. Data were collected through focus groups and one-on-one interviews with Black male student-athletes at a Midwestern NCAA Division I institution. The study highlighted that students make conscious efforts to combat media stereotypes by succeeding academically and socially; areas that are both outside of athletics. 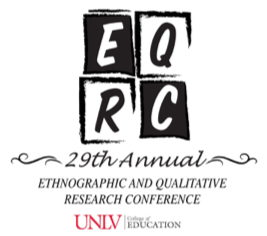 EQRC is an annual national research conference for presenting qualitative research. This January marked the research conference’s 29th annual meeting. This year, the conference was sponsored by the University of Nevada at Las Vegas (UNLV) College of Education. To learn more about EQRC, click here. To watch a YouTube video of the presentation, click here. Wei LAB Director and Chief Research Scientist Dr. Jerlando F. L. Jackson and Wei LAB Assistant Director and Senior Research Associate Dr. LaVar J. Charleston presented their project: “Beyond the Game: A Passport for Collegiate and Career Success” at the Black Student-Athlete Summit on January 6, 2017. Their research examined the Beyond the Game™ (BTG) initiative designed by the Wei LAB. The project addressed concerns and challenges that Black student-athletes face, and how to promote academic and social success for these students. This year marked the third annual Black Student-Athlete Summit. Hosted by the Division of Diversity and Community Engagement at the University of Texas at Austin, the annual summit brings together scholars, athletic directors, coaches, academic advisors, and professional and student-athletes to discuss critical issues surrounding Black student-athletes. The Wei LAB served as a sponsor for this year’s event. Dr. Jackson is also the Vilas Distinguished Professor of Higher Education in the Department of Educational Leadership and Policy Analysis at the University of Wisconsin-Madison. More information on the Black Student-Athlete Summit can be found here.